Starstruck Theatre’s production of Shrek The Musical opened at the Smith Center in Ohlone College on January 11. The production followed Broadway’s musical adaptation of the classic DreamWorks Animation motion picture, Shrek. The musical features a humorous script that engages viewers of all ages, weaving lighthearted messages and well-choreographed dance numbers throughout the production. Mirroring the film’s plot, Shrek The Musical follows Shrek (Roeen Nooran) and Donkey (Diego China) as they journey through the fictional kingdom of Duloc, befriending fairytale creatures along the way. 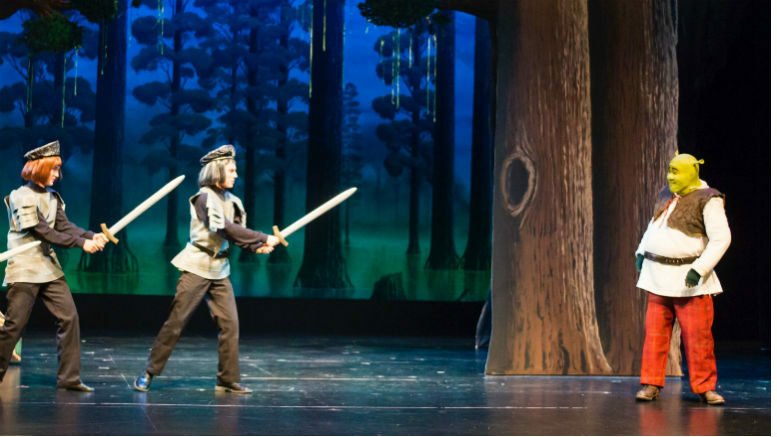 Under orders from the villainous Lord Farquaad (Zarif Shahid) to rescue Princess Fiona (Anne Marie Salgado) from her dragon-guarded tower, they learn the importance of celebrating diversity and overcoming differences. Slightly departing from the original fan-favorite tale, the play inserts additional subplots that add richness depth and to the story’s message. In the opening monologue, Shrek’s parents tell young Shrek a universal message, “People hate the things they cannot understand.” This message is echoed from beginning to end, presenting a touching story about celebrating diversity and overcoming differences. Unlike the emotional aspects of the script, some of the humor felt more embarrassing than entertaining. The inclusion of too many jokes referring to bodily functions cheapens the emotional value of the deeper, emotional message. The original Shrek franchise has a large fanbase, and by overdoing the crude jokes, the musical risked ruining what fans love about the classic Ogre — his dry, ironic sense of humor. However, the detailed costume design compensates for excluding the beloved main character’s quick wit: Shrek’s costume was surprisingly realistic, with bright green body paint and waxy-looking rubber ears, successfully depicting his frightening yet delightful personality. Adapting the animation’s imaginative, anthropomorphic characters to theater proved to be a mesmerizing success. The vocal performances were even more impressive. Notably, the Dragon’s (Ella Child), solo of “Forever” was the single most impressive moment of the production. Child’s breaktaking vocals garnered cheers and whistles from the audience, and a standing ovation at the end. When the entire cast gathered on the stage for a vibrant finale performance of Smash Mouth’s cover of “I’m a Believer,” the audience was on their feet, clapping along enthusiastically. The addition of sparklers in the final scene provided a larger-than-life aesthetic to finish off a dazzling performance. Despite crude humor and dialogue that fell flat, fantastic vocals and a unifying message about unity in diversity make Shrek The Musical a journey worth taking. Be the first to comment on "Shrek The Musical proves to be an Ogre-Achiever"